“People maybe disabled by body but not by mind.” Says Lalita Paikra. She was born in a very poor family in Kurkelkhajri village in Jashpur district of Chhattisgarh. She had faced a lot of difficulties in her childhood because of the financial condition of her family but life became much harder when she was 16 years old. Both her legs became permanently disabled in an accident at that tender age. She had to give up studies after that accident because of difficulties in walking. Everyone in her family would go out to work in the fields and Lalita would rear animals. 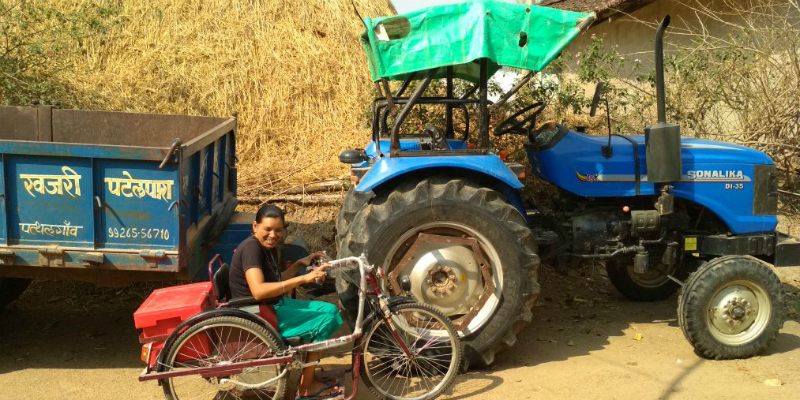 One day, Lalita learnt about Chhattisgarh government’s schemes for the differently abled people in a village Panchayat meeting. She enquired more about those schemes and applied for some of them. She got a loan of 71,250 rupees at the interest rate of 5% to start a grocery shop in 2012. She also got training to run her business. After getting the training she started the shop. Soon she was earning 4-6 thousand rupees from the grocery shop and also repaid the loan in due course of time. This increased Lalita’s confidence level and she geared up for more. In 2015 she took another loan of 4,50,000 rupees from the social welfare department to start agricultural work and also applied for tractor and trolley. With the help of her brother she started to run agricultural activities. Lalita was now making a considerably good amount of earning and she was becoming more and more influential in the village day by day. Yet she did not stop there. She wanted to achieve more. Lalita took a training under the Mukhyamantri Kaushal Vikash Yoajana in making of smoke bulbs. She successfully completed the training programme in Jashpur Livelihood College and now she was skilled in making the smoke bulbs. She also got an opportunity to display her products in a trade fair in New Delhi. Today, Lalita is an inspiration for many women and also the differently abled people. Earlier she did not have a pucca house but now she has got a pucca house constructed under the Paradhan Mantri Awas Yojana. By investing another 75,000 rupees on her own she made the house bigger and better. Lalita has also got a motorised tricycle from the administration. Earlier it was difficult for her to move to various places but today she can easily travel to her establishment or any other place easily with the tricycle. This has helped her save a lot of time, energy and effort. Lalita is no longer living in poverty and helplessness. Today she is an empowered individual who lives her life on her own terms. She is grateful to the district administration and the social welfare department for their support in making her dreams come true. Her achievements have also been recognised by the Chhattisgarh Chief Minister Dr. Raman Singh who had paid her a visit and had lunch with her. Lalita encourages other women and the differently abled people to pursue their dreams without any insecurity and hesitation.